Samsung’s previously rumored Galaxy A40 has made an appearance in a benchmark test, providing the first glance at its specifications. Furthermore, some details about where the phone will be released have also surfaced. 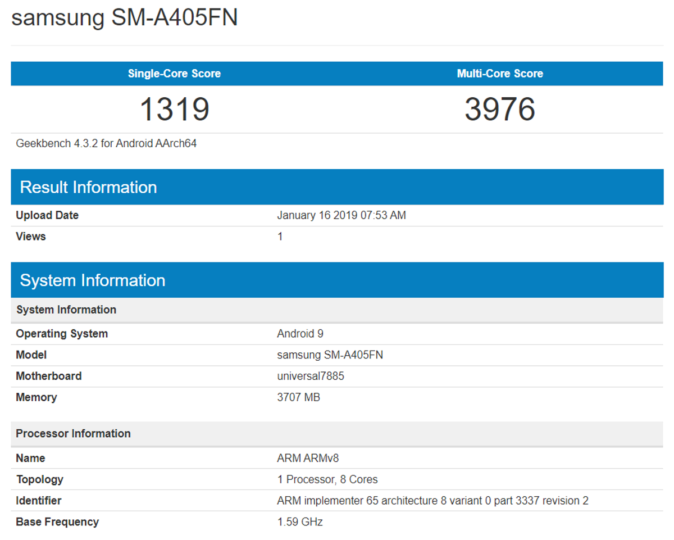 As is so often the case, it is benchmark test Geekbench that spills the beans on a new Samsung device with model number SM-A405FN. Chances are, this is the Galaxy A40 which is supposed to be one of the new A series devices packing an AMOLED display. As GalaxyClub points out, the listing reveals hardware similar to last year’s Galaxy A8: the Exynos 7885 soc is accompanied by 4GB RAM. Just like the upcoming Galaxy A50, the A40 runs Android 9 Pie out of the box. Whether the Galaxy A40 will share some of the A50’s characteristics, such as a 4,000 mAh battery, remains to be seen. A fingerprint sensor that is integrated into the display is likely to be a part of the package as well. And of course, we expect it to have some type of notch or punch hole to accommodate the front camera. Furthermore, it is confirmed that the benchmarked A40 variant, the SM-A405FN, is headed for a variety of European markets. Development is underway for devices for the UK, Germany, France, Poland, Netherlands, Scandinavia, and other markets. The A40 is thus the second device in Samsung’s European Galaxy A lineup. The Galaxy A50 will make its way over there as well. At present, no launch or release date is known for any of the new Galaxy A phones. The fact that both the Galaxy A40 and A50 are being tested with Android Pie suggest they will be launched after the Galaxy S10 makes it debut. Only the Galaxy M series will see the light of day before the new flagship devices, and they will be released running Android 8.1. For now, we assume Samsung will start selling the new A series at some time during the spring. Fix cookies on website. I have to accept cookies again and again enable dark mode.